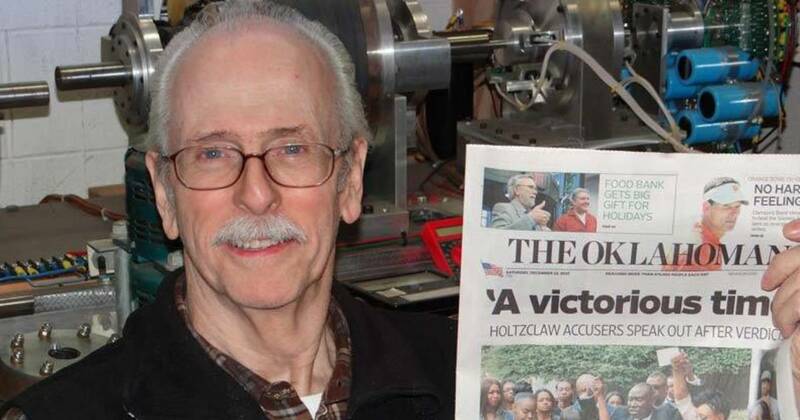 This Man Cracked Tesla's Secrets - So the Internet Had Him "Killed"
Jim Murray Holding a Newspaper from December 12, 2015 to prove he did not die in September. Jim Murray Holding a Newspaper from December 12, 2015, to prove he did not die in September. Jim Murray, the “Tesla Man” that has discovered many of the Serbian scientist’s secrets, is my neighbor. Not only is he my neighbor, he has become a part of my family. Jim often has dinner with my wife and I, attends my family gatherings, and even officiated my wedding. Jim has been electrifying the world for over 50 years. His lifetime of experience has produced dozens of patents, inventions and now a truly remarkable discovery that can fundamentally change the way that human beings use energy forever. After The Free Thought Project’s initial story about Jim Murray, there was speculation about the authenticity of his work, and our subsequent coverage of it. Conspiracy theories sprung up within hours of the piece being first posted on social media. People said that Jim would be killed by the government or by a rogue energy corporation that would never allow Jim’s work to see the light a day. However, it was the weirdest and most morbid theory that seemed to be the most popular. Thinking nothing of this because – spoiler alert – Jim is alive and well, I continued my daily routine of news hunting and meme making for The Free Thought Project. I waited until Jim returned home from his work day before I said anything to him about it. I caught him before he could get his keys in the front door. “Hey, Jim! You’re alive,” I said in a shocked and sarcastic tone. He turned to me and gave me a look, which I interpreted as, “What the hell are you talking about? I am standing right in front of you.” I then informed him of the internet rumors, and we had quite a laugh. I invited him over to my home and we celebrated the publishing of his article with dinner. We had no idea that the fodder being hurled around on social media would manifest into something that would impact our efforts to assist Jim and help him with his endeavor to write and publish, “Genius Never Dies” — A tell-all book of Jim’s fascinating life and discoveries. Feeling quite proud that Jim’s article was well received by the vast majority of the internet, I continued my life as usual. About 48 hours after a celebratory dinner with my neighbor, I went to the crowdfunding website to see the donations Jim had received. The page was gone. Where did it go? A collective effort to diagnose and cure the problem ensued. We discovered that the crowdfunding page had been removed because of the number of complaints received from the internet users who were duped into believing Jim had already passed away. Unsure of what the final outcome of the situation might be, and thinking the worst, I regretfully notified my neighbor. Jim was unfazed. “I’ll find a way to write the book, regardless,” Jim exclaimed with seemingly no disappointment. I, on the other hand, was furious. It’s difficult for me to be hard on the people who ask tough questions. I consider myself to be a “conspiracy theorist.” Who isn’t anymore? The term “conspiracy theorist” was coined by the US Government to condemn citizens who questioned the official narrative of the JFK assassination. A few weeks ago, declassified documents revealed that the CIA admitted to having a hand in the assassination cover-up. However, in the case of Jim Murray, the conspiracy theorists shot inside the proverbial tent. They hindered the ability of Jim to gain funds that would be used to directly help expose a huge puzzle piece of the big picture. This illustrates the importance that we must all individually place on ascertaining the truth for ourselves. It is imperative that we ensure that our research is accurate. The momentum from the initial article was fading, and our efforts looked to be on the brink of futility. We waited days for his donation campaign to be put back up. Luckily, after some back and forth via email, GoFundMe finally delivered, put the page back up and restored the funds. Since the fate of Jim’s crowdfunding campaign was unknown for so long, we had no choice but to devise a backup plan. Even though the donation page was restored, we continued with plan B. We had to vindicate Jim Murray’s good name and silence the voices that claimed that Jim was pushing up daisies in Tulsa, OK.
After Jim’s initial article proved to be so popular, I was put in touch with fellow journalist and activist, Derrick Broze, who writes for websites TheAntiMedia.org and TheConsciousResistance.com. Mr. Broze wanted to interview Jim and clarify some of the same things we wanted to. Derrick also had recently organized an event and invited us to come to Houston and attend. Being it that Jim and I both live in Oklahoma City, Houston wasn’t so far away, so we took Derrick up on his offer. After arriving in Houston, Jim and I settled in a hotel and met up with other members of The Free Thought Project team that were invited to Houston for Derrick’s event. Whenever you go anywhere with Jim Murray, you never know what might happen. Strange things seem to follow this man around. To be more specific, strange coincidences. Coincidences that make you wonder that coincidences may not even be coincidences. Around Jim, it seems like everything is planned to happen just the way it is supposed to. Some might call it a continual manifestation of fate. The morning after we arrived, while I was still asleep, Jim went to the hotel gym to get some exercise and then proceeded to the complimentary breakfast. Seem normal? Just wait. While on the elevator, making his way to the continental feast, Jim struck up a conversation with a woman. They exited the elevator and continued walking and talking. Jim didn’t know it at the time, but he wasn’t following the lady to the free breakfast. It was breakfast alright, but it was a private breakfast that was set up at the hotel for NASA medical staff and scientists. The woman was already pleasantly surprised by the intellectual conversation she was having with Jim, so naturally, she invited him to stay. While Jim had his fill of the morning meal, more NASA employees began surrounding his table as he was speaking with the kind woman. It turned into a lecture, of course. Jim spoke of Tesla, and some other topics. One of the NASA doctors took notes. However, it wasn’t all a one-sided conversation. Jim admittedly learned from his new acquaintances the effects of microgravity on the human body. When the breakfast was nearing its end, Jim was approached by a NASA employee who said to him, “I hope you realize that this meeting was not coincidence.” Jim responded and told the man that he didn’t believe in coincidences. They both shared a smile. After Jim’s “coincidental” NASA breakfast, he and I enjoyed Derrick Broze’s event, “For The Community Ten” music and arts festival, sponsored by Broze’s group, “The Houston Free Thinkers.” It was truly an amazing spectacle of which we all enjoyed. The bands were incredibly talented, and the art was just as satisfying to the eyes as the music was to the ears. Our weekend concluded the next morning when Jim and Derrick finally collaborated for the below eye-opening interview. Here is the link to Jim’s ‘reinstated’ Go Fund Me, after they realized he isn’t dead.